As we said a while back, Tfl had arranged to meet with us in the New Year to update us on their plans for CS5, specifically the section from New Cross to Lewisham. Now, this in itself is a matter of some dissension amongst local cyclists. Some want TfL to grasp the nettle, and drive it straight along the main road, through New Cross and down Lewisham Way and Loampit Vale, doing whatever it takes to make it safe and efficient. Others think that they should abandon the plan to take it all the way to Lewisham, if a fast route through the centre of New Cross and Lewisham can’t be provided, and use the money to deliver a high quality CS4 with a protected cycle route along the A21 linking that to the rest of Lewisham. 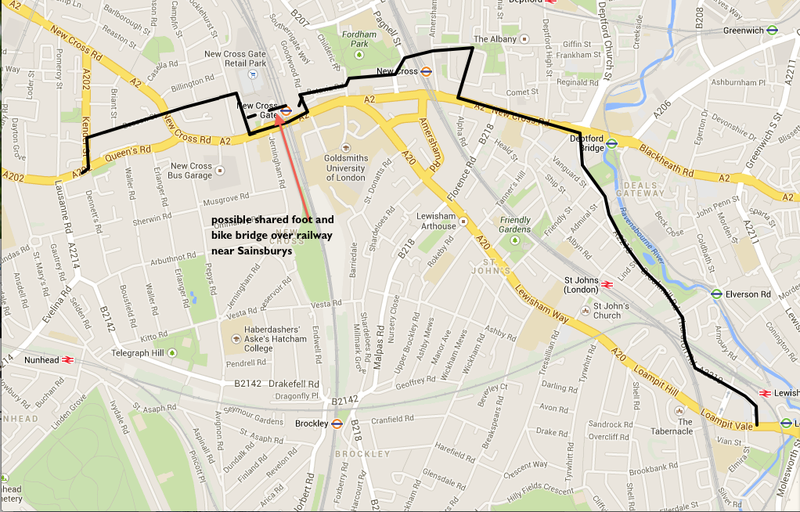 TfL, however, are committed to extending CS5 somehow to give a fast link to Lewisham. They met with us in January to explain how and it quickly became apparent they believe two things. Firstly, they have invested too much time and money in this already to abandon the idea and move on to something else and secondly, they do genuinely believe they can deliver a good piece of infrastructure which will be safe, pleasant to use and the fastest option available without using the most direct main roads. They know that there are a few difficult areas in this that have to be tackled. They know a safe way has to be found to get cyclists through the Deptford Bridge junction and the engineer we spoke to has observed the junction and said exactly what we have been saying for years. That there is plenty of space there to work with. The junction opens out unnecessarily in to four lanes one side, 3 on the other in places, six or seven lanes to deliver traffic in both directions to roads which can take one lane each way at several points. He strongly believes this space can be used to make safe space for cyclists and get them across on to Brookmill. We had earlier discounted Brookmill, due to the first few yards being narrowed by the parked cars, a very tight junction where you feel very squeezed by motor traffic, often dangerously so, unless some changes were made, possibly removing parking , slowing motorised traffic in some way on the turn, and controlling its movements here. In previous discussions, TfL hadn’t agreed to this. Now they are taking it on board as they agree this route cannot work without some radical changes to the road layout at key crossing points and control of motor traffic speeds and movements. It seems they have taken this view partly because our suggestion of Albyn Rd as an alternative, being a nice, residential road in a conservation area was deemed unsuitable for Superhighway treatment. Which we agreed with at the time, but saw as the only option for a safe route if they weren’t going to do serious work on the alternative. I know some will still think this is a waste of time and money which would be better spent on CS4 and creating good, safe fast links to it from other areas of the borough and beyond to outer boroughs. This is a valid argument, and one we put to them again. They seem to think both will eventually happen. However, it looks likely, if it gets through the feasibility studies, they will go ahead with this. My own feeling, is that, if we get a redesign of Deptford Bridge that works for cyclists and pedestrians, plus a safe way into Brookmill, we won’t have done too badly. The superhighway engineers are desperate for a success story, remember. They are, and they should be, extremely anxious that the next superhighway works and is seen to work safely. I am hopeful this means they will bend over backwards to make sure they learn from the mistakes they have made and produce something really useful that improves the streetscape in our area for everyone. I say hopeful. I am not sure how confident I am of this, but we will do what we can to keep an eye on it, and feedback to you, at all stages of its development. Given that cycle superhighways are supposed to be “safer, faster and more direct”, it is difficult to see how such an indirect route that doubles the distance compared with staying on New Cross Road, takes you up and down some reasonably steep hills compared with staying on NCR, involves half a dozen right turns, and will require radical changes to local parking arrangements is going to be justified. My view is that either they tackle the gyratory system or just drop the back roads section and leave a gap between Queen’s Road and Deptford. No use wasting money pretending that this convoluted arrangement is going to deliver something that is actually going to be used for fast, safe journeys.